Just like with children, sometimes it takes a little guidance to get your appliances to play well together. 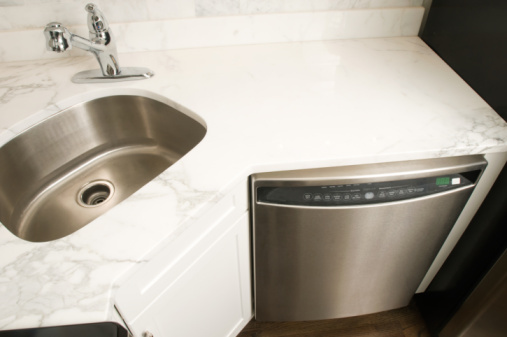 Whether you've installed a new dishwasher with an existing garbage disposal or vice versa, overlooking one small detail can cause the unfortunate problem of having your dishwasher fail to drain. In this instance, the culprit is often what's called a knockout plug. Luckily, as its name implies, solving this problem is as simple as knocking out a plastic plug. Doing this allows water to travel freely from the dishwasher through the garbage disposal drainage pipe. Unplug your garbage disposal so you can work safely. You'll need a hammer and screwdriver to get this job done, and needle-nose pliers are optional for the final step. Usually located near the top of the unit is a drainage port where the dishwasher's drainage tube gets attached. If this tube is attached already, disconnect it using the appropriate screwdriver for the job. Inside the garbage disposal, behind this tube mount, is where the knockout plug lives. Using the screwdriver, poke into the drainage hole on the disposal unit. Does it insert freely? If so, the drainage plug was removed already and any drainage problems you may be trying to solve are of a different nature. If the screwdriver hits something solid, then the knockout plug is there, and now it's time to remove it. Using the hammer, lightly tap the back of the screwdriver against the knockout plug repeatedly. Move the screwdriver around the perimeter of the plug, tapping all the while with the hammer, so you can cleanly remove the whole knockout plug. Before long, the plug will fall back into the disposal unit. Now, either using your hand or needle-nose pliers, reach down through the sink opening and find the plug. Take it out. If the plug looks like a complete circle, you've done a great job. Return to the now-open hole in the disposal unit and feel around the inside. If the hole is fairly smooth – no jagged edges – and the opening is as wide as the tube feeding into it, then you're finished with the knockout plug. If there are any jagged edges, a small file or paring knife can round out the hole. But this shouldn't usually be an issue – after all, these plugs are designed to be knocked out. With all that done, it's time to attach the dishwasher drainage tube. With the knockout plug removed and a tightly fitted drainage tube attached, your dishwasher and garbage disposal are now destined to play well together.